Research scientists camped at the desolate McMurdo Dry Valleys of Antarctica studying the local lakes and streams are one day surprised to find a young Weddell seal in their midst. Tired and hungry, and perhaps lured by the smell of the group’s cheeseburger dinner, the young male is a long way from his natural habitat on the sea ice of McMurdo Sound. 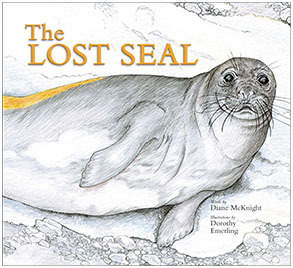 Bound by the Antarctic Conservation Act, the scientists know they cannot provide it with sustenance, but instead contact seal scientists who, after some thought, decide they can provide assistance so the seal can return to the sea ice. The seal gets the ride of its life back to its natural habitat, and the scientists name one of their newly found streams to commemorate their unlikely campmate. Translations available in: Maori, Greenlandic, Hawaiian, Mandarin, Passamaquoddy, Spanish-only, Spanish-English.